I received a comment on my Roasted Tomato post that got me thinking. Tiffany of Como Water wrote that January is 1/12 of my life and I should find a way to enjoy it. I had never thought of it that way. To me winter has always been something I need to survive to get to the good stuff. I decided to try to figure out what it is about the winter that bothers me so much. Basically it comes down to two things; the dark and the cold. It’s pitch black when I wake up in the morning and its pitch black when I leave the office at night. The darkness is depressing and tiring. And then there’s the cold. Yuck. I’m one of those people who thinks a hot humid day is heavenly. The cold makes me, well, cold. And tense. Every time I step outside I can feel all of my muscles contracting, and they stay stuck that way all day. So what can I do about this? My first solution is to spend some time outside and enjoy what little sunshine there is. I’m thinking walks at lunch could cover this. The second solution is to stay warm. If I’m going to enjoy my walks I need a good coat (can you say Canada Goose?). And I need nice warm bowl of soup when I get home at night. My first soup of the month is Curried Carrot and Lentil. It was kind of an experiment as I had no recipe to follow, but I think for the first time a non baking experiment has worked for me. The carrots and red lentils are a great base to the soup, the curry and cayenne and some nice heat, and the coconut milk adds just the right amount of creaminess. I think it’s perfect to come home to on a cold January night. In a large soup pot, sautee the onions and carrots for 3 – 4 minutes until the onions have softened. Add the mustard seeds, curry, and ginger. Cook, stirring to keep the onion from burning, until the mustard seeds start to pop. Add the cayenne and lentils, then add the broth and coconut milk. Bring to a boil then simmer for 20 minutes. Let cool, then puree with an immersion blender or blender until smooth. What a great looking recipe! Good point about a month being 1/12 of your year/life! I love sunny cold days and a good bowl of soup. This looks divine. My bff will love this! This sounds like a soup that could definitely warm me up! Great photos! I think the hot humid day (of the Toronto/Montreal sort) is awesome too! Except when I need to go for a run, then give me 0 degrees Celsius, please! But this soup is delish, I am saving this recipe. I had to laugh when I read this. I feel the same about winter. I did buy a Canada Goose and it has altered my perception of winter. Not the darkness part, but definitely the cold. Now we just need electric gloves! The soup looks lovely by the way. I’m bookmarking it now so I can make it soon. Stay warm. This soup definitely looks warm and inviting. I love the swirl on the top. This soup looks perfect! Just what I need to get me over the winter hump. Your soup looks wonderful, BTW. I love the bright cheerful colour… goes such a long way towards banishing those winter blues. Mmm…I saw something like this @ Williams-Sonoma this morning and it got me thinking about making a soup similar to it. Yours looks wonderful. Spicy, savory, sweet. Love it! Looks fancy, too! Well this soup is the perfect way to enjoy flavours, textures and vegetables. The presentation is wonderful. I can’t wait to try this. coconut, cayenne, ginger – all so good and good for you! Love this one, Lynn! 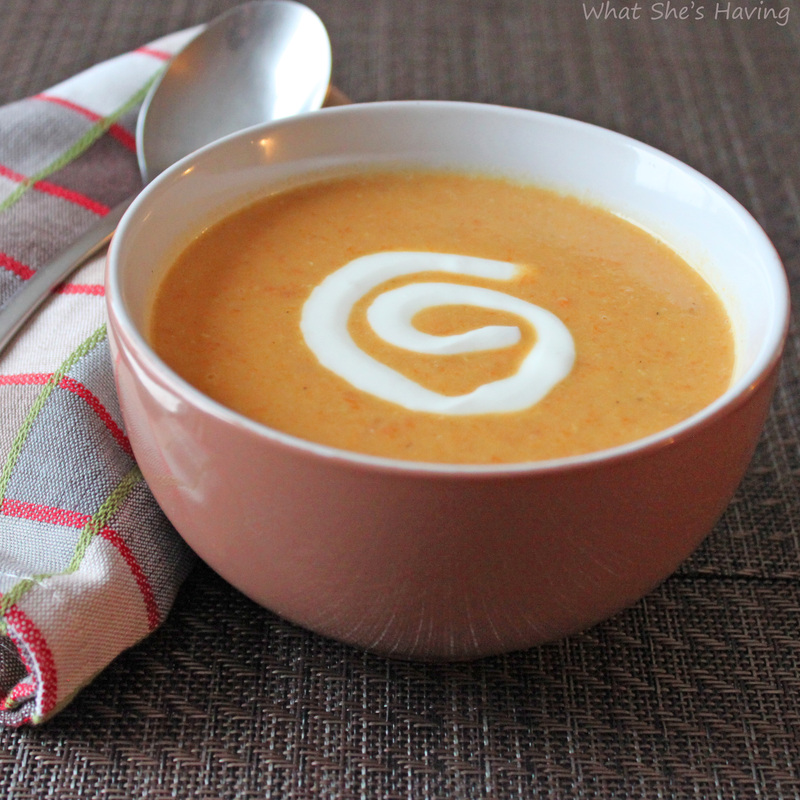 I’ve made this soup countless times, but never with coconut milk, until today – carrot ginger soup is forever changed! A total keeper. Yum! This soup looks delicious, just what I need after a cold/freezing day.